"Experimental Researches in Electricity". Thirtieth Series. Philosophical Transactions of the Royal Society of London. 1856. 146: 159-180. Faraday conducted numerous experiments in electricity, and published his results over the span of a decade in the Philosophical Transactions. 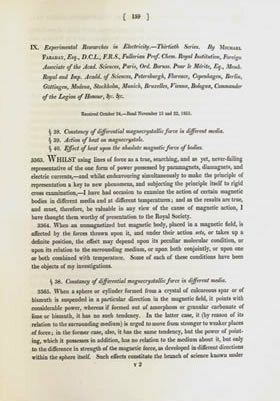 The serial nature of a periodical enabled him to publish and disseminate news of his findings as it occurred, rather than waiting to amass a body of work sufficient for a monograph. Faraday is credited with the discovery of electromagnetic induction in 1831 – the basis upon which electric generators and transformers are constructed. Faraday also proposed the principles of modern Field Theory which were later expressed mathematically by James Clerk Maxwell in1861. Field Theory explains how the lines of magnetic force that surround a magnet are the center of its energy rather than the object itself.